I made this for a one on one swap. We had to have multiple layers on the card. It was also a sketch I saw somewhere :) Nothing like checking 2 things at once off my TO DO list that seems to grow and grow! 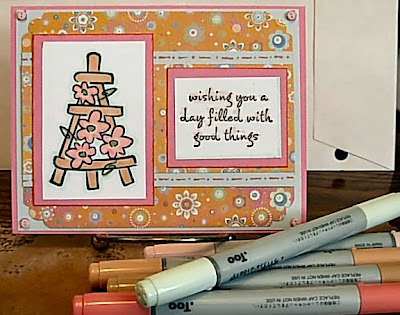 I used my DCWV patterned paper Pocket Full of Posies and some white and pink paper from Hollo's. I stamped the trellis (idk who makes this stamp does anyone know? it is clear one with several other neat stamps in the set too!) with my Pallete Noir inkpad and then used my Copic markers R11, R22, E31, E11 and G00 to color the image in and add the border around it. See I colored the inside of the image too with the G00 Copic to make it more uniform looking. I used one of the Copic markers to add the faux stitching along the center piece of layered paper also and then thought the corners kinda looked odd since I had corner punched the Posey paper for the back mat. So I dug out these teeny tiny buttons I have and added one to each corner. You can't tell in the pic but that was also to cover up the mistake X faux stitch thing I tried for the corners LOL! ha ha Next step would of been to get out my cuttlebug and cut some corners to add on it! Never mistakes only opportunities to find new ways of doing things! Yeah ok I will keep telling myself and you all that! I really liked this one and in fact made another one too and sent it to a friend. Not quite the same but along the same lines and similar enough I won't post here and bore you all! the SNOW has started here we have already about 1/2 an inch at my work and it is blowing already too the trees are dancing away in the wind! Pretty yes but scary for later and tomorrow is supposed to be the bulk of it! YIKES!